We’re currently raising $5.7M in Series A Preferred Stock to commercialize our STAR-3D hybrid-rocket engines. With this full funding, we can complete prototyping of our engines, accomplish our DARPA testing, and launch our first sounding rockets. It’s simple. The biggest and most expensive hurdle in space launch is the rocket engine. Liquid rockets are complex, unreliable and expensive – hence the term, “This isn’t rocket science.” Solid rockets can’t be throttled and need special handling to prevent premature detonation. Hybrids have long been known to be the answer, but no one could get them to work reliably. Over the decades, scientists have experimented with different materials and different manufacturing methods, but we’ve cracked the code! Can you transport a rocket motor in a pickup? How about on an airplane? We can and we do! But when combined under specific conditions, we create the explosive thrust to reach orbit. You have complete control from startup to shut down. Enjoy the flexibility of liquid engines with the power of solid boosters and the safety of hybrid technology. 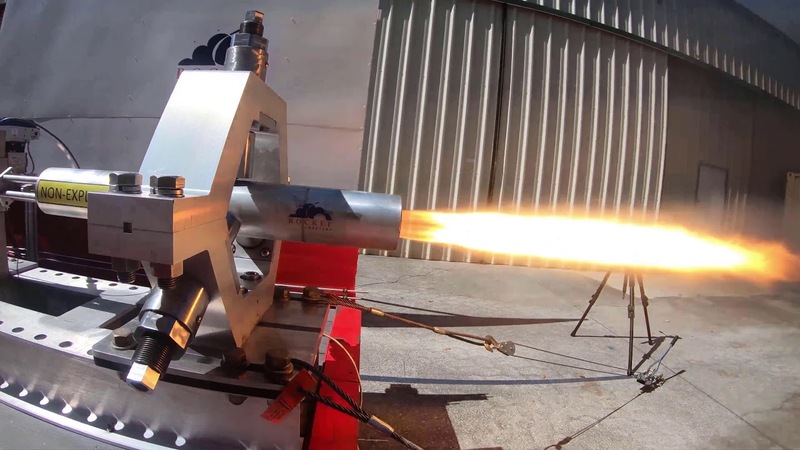 Our rocket motors cost a fraction of any solid or liquid engine. With Rocket Crafters for launch, you can put your budget into your real interest – your satellites or experiments. Consistent, smooth, powerful burns time after time. We’ve not had a bad test yet. And with fewer moving parts needed for a hybrid, there’s less that can go wrong on launch day. The coolest motors, hot off the printers. With 3-D printing, our solid components guarantee a smooth burn every time. Truly “Green” launch. Yes, we are eco-friendly. Our burn process converts plastic into steam. Prices to match your priorities. You want to put your money into the what matters – your satellites or experiments. Our launches cost a fraction of our competitor’s prices. First launch of the Intrepid-1 is planned for Q3 2020. Our mission is to provide safe, reliable, cost-effective, and eco-friendly launch services that revolutionize access to space and make it available to the rapidly growing small satellite market. We will accomplish this with Intrepid-1™, the world’s first mass-producible, ‘launch-on-demand’ small satellite launcher. In 2017, we were awarded a DARPA research contract to develop and test large-scale hybrid rocket motors. Our technology has been featured in Newsweek and on The Discovery Channel. What happens when you get an Astronaut, a Top Gun, a Rocket Scientist and some Tech/Finance guys in the same room? Let us introduce you to some of the Team. Sid Gutierrez, Chairman of the Board: What’s a rocket company without a Steely-eyed Rocket Man? Sid has logged time in orbit as a space shuttle Pilot and Mission Commander. Sid was a Colonel in the USAF and Center Director of Sandia National Laboratories overseeing a variety of disruptive space technologies. Sid saw the potential in Rocket Crafters’ technology and retired from Sandia to become our CEO and Chairman of our Board of Directors. Grant Begley, CEO: Grant is an experienced aerospace industry executive. He served in the Navy as DoD Director of Stealth, Counter Stealth-Technology, Policy & Advance Programs; at Lockheed Martin as Director of Advanced Concepts; at Raytheon as Senior Director Mission Systems Integration; and at Alion as Corporate Senior Vice President and Chief of Business Development. Grant brings his expertise in developing successful national space programs from concept to operations. Rob Fabian, President: A retired Air Force Colonel and Rand Fellow, he has in-depth knowledge of space and missile systems as well as a proven track record managing the personnel, constrained budgets, and highly complex processes that are crucial in bringing RCI’s innovative new rocket motors to market on-time and on-budget. Rob’s been excited about RCI since he first heard about them while still on active duty, and traded a comfortable retirement in Utah for the adventure of launching rockets. Paul Larsen, CFO, Treasurer: Business isn’t rocket science, but contracting, proposals and organization can get equally complex. Paul earned his MBA from Harvard and has over 30 years’ experience in the Air Force contracting field. He held an unlimited warrant as a contracting officer and was Chief of the Ogden Air Logistics Center Pricing and Finance Division and worked as a senior consultant, assisting companies in developing and negotiating contracts with the Federal Government. Sean Mirsky, CIO, Finance Chair: It’s vital to have a money guy who understands the tech. Sean came from the fast paced world of High Frequency Trading where he worked as a Director at Jump Trading and Infinium Capital Management after starting his career off at Goldman Sachs. Until he joined Rocket Crafters in 2016, he was best known for having built the lowest latency communications networks in the world for trading. Sean lives by the statement “The solution exists, we will find it”.